FUN. reliable. BUILT TO LAST. Set aside at least a weekend or two to build your new playset. Recruit friends or family members to help. Consider a spot you can see from a window so you can keep an eye on the fun. Make sure play area is obstacle free by at least 6 feet on all sides. Watch out for underground utilities and tree branches overhead. Make arrangements to move your curbside delivery to the play area. It’s likely to be multiple packages, so be ready. Choose solid level ground such as grass or soil. Avoid hard surfaces like asphalt and concrete. Remove large rocks. Add rubber mulch or similar protective surface. Anchor playset to the ground as instructed by playset manual. Grow your kids’ imagination while giving them endless hours of fun and physical activity, on new playground equipment from The Home Depot. 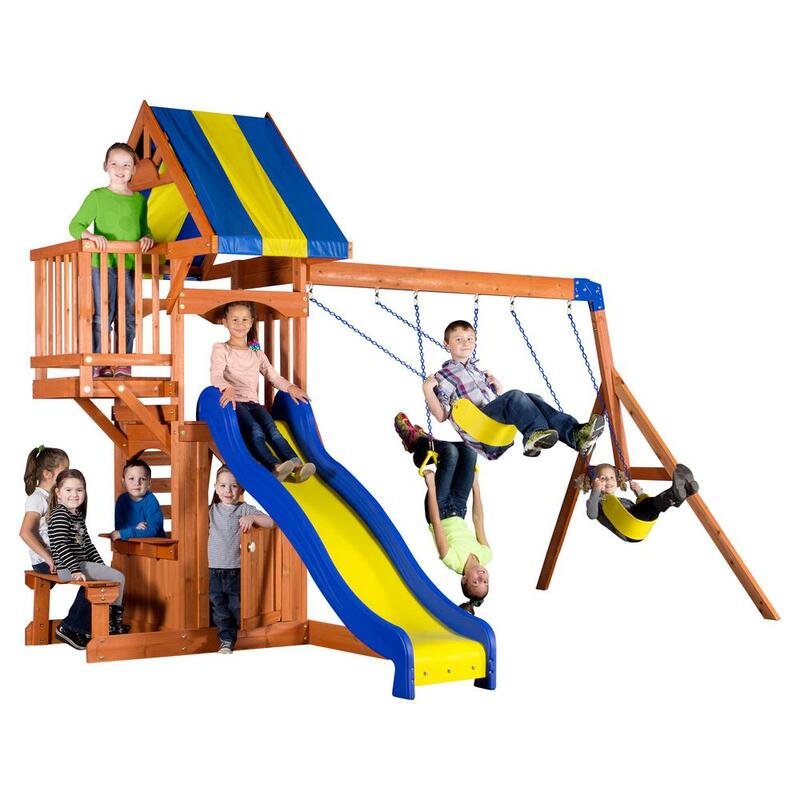 Whether you’re looking for backyard playgrounds, swing sets or playhouses, we have the outdoor play equipment to fit your yard and your budget. Kids get a safe space to have fun and be entertained for years to come and parents feel good knowing their kids are secure and playing nearby. The size of your yard will be the major factor in deciding which backyard playground is best for you. You’ll want a safe play zone. So, make sure you have at least 6 feet of space around the play sets. 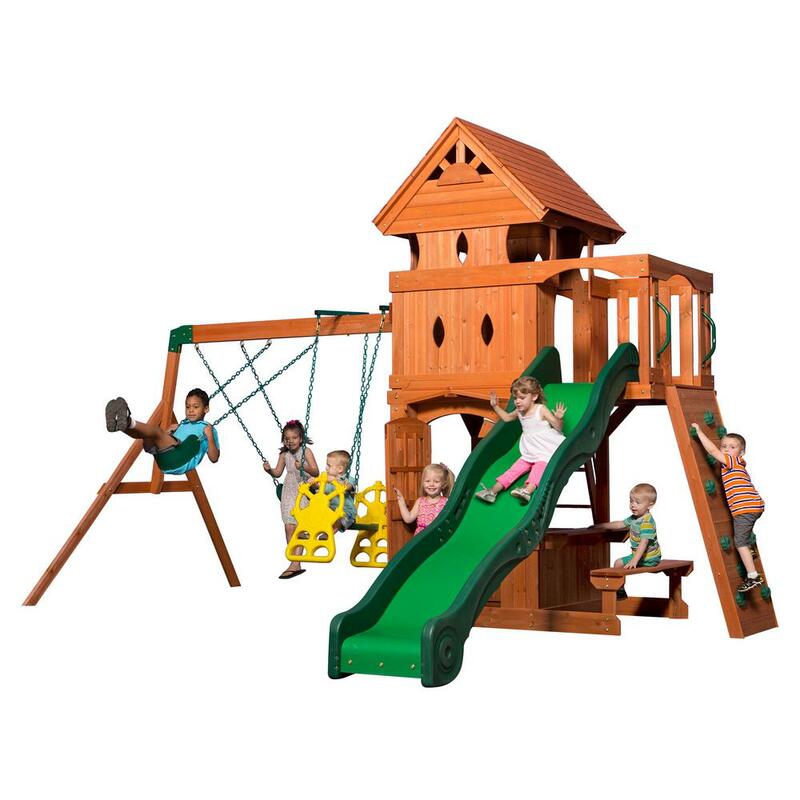 We offer a variety of durable, long-lasting playground sets in wood, plastic and metal. Plus, manufacturers are making them easier than ever for you to assemble with pieces that are pre-cut, pre-drilled and pre-stained. In many cases, the playground equipment comes ready-to-assemble with everything you need in the box, including the lumber, accessories and hardware. Your new playground equipment can provide kids with hours of creative outdoor play and high-flying fun. There are a variety of accessories and add-ons to choose. Keep your boys and girls busy with a swing, trapeze, monkey bars, a slide, and a see saw. Consider a playground set that has a fort on top and sandbox underneath. Choose other options, like a rock wall, ladder, or snack stand. There are so many options. And, while your kids are playing and having fun, they’re also getting exercise and developing motor skills. The beauty of outdoor playground equipment is that it can grow with your child. For instance, if you’re purchasing playground equipment for your preschooler, you might decide to start with an infant swing or bucket swing, glider and a toddler slide. As your child gets a little older, you can then switch out the accessories. 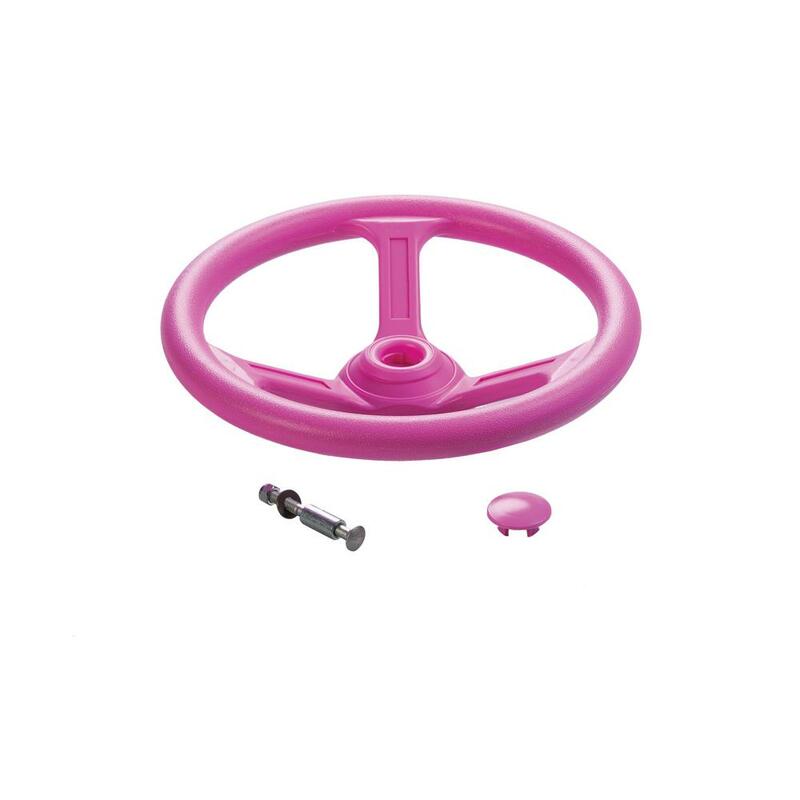 Upgrade that infant swing to a standard belt swing and graduate from the toddler slide to a larger, faster slide. Once you’ve chosen the playground equipment that’s right for your child, we will deliver it to your curbside, no problem. You’ll have to move your curbside delivery to the area where you’ll set up your outdoor play equipment. Choose a spot that’s level and free and clear of any trees or rocks. If digging is required, be careful not to disrupt any gas or utility lines. Make time for the setup. You’ll want to set aside a weekend (maybe two) to build your new playset. Most play sets require at least two adults to assemble them. 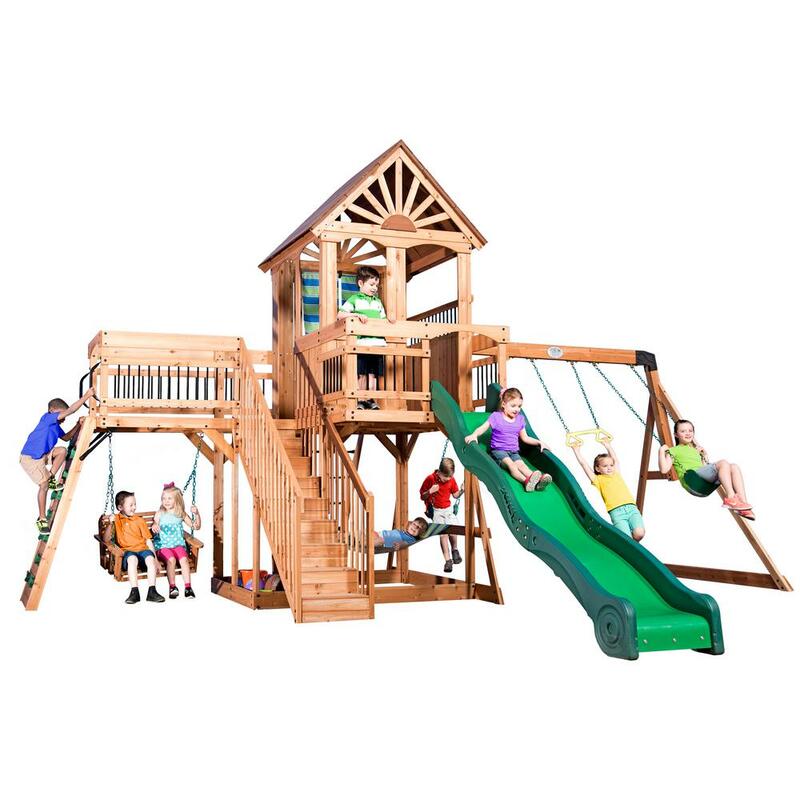 Take your child’s imagination to higher heights with new outdoor play equipment from The Home Depot. We offer a wide selection of safe, sturdy, kid-friendly structures for hours of outdoor fun. You’re bound to find a play set that’s perfect for your size backyard and your size budget. We also offer top-rated commercial swing sets for park and school playgrounds. Shop now and have your playground equipment delivered right to your curbside.